After Dr. Cohen’s initial visit with us, we felt as though someone had hit a “fast forward” button. Annie was assessed by the surgery team, we met with anesthesiologist, and several more scans and pre-op tests were ordered. 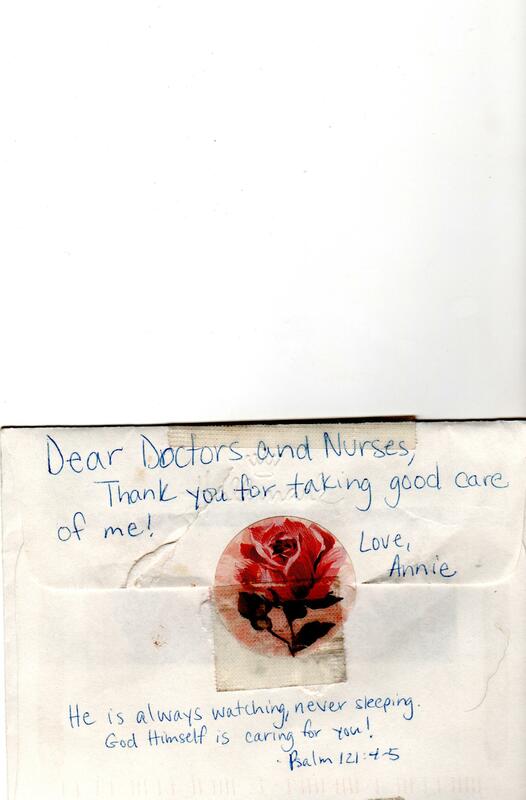 In addition, the nurse drew a unit of Annie’s blood to be saved in case she needed a transfusion during the surgery. We explained this flurry of activity to Annie in a straightforward, simple way. “Remember that we told you about the bump inside of your head, called a stroke? Well, the doctors are going to help it get better by using an operation.” When we told her, her brown eyes widened with fear, and she began to cry. We held her and told her we loved her, willing our own fears away as we comforted her. Still, there was no way to ignore the mounting anxiety as we approached the surgery. Corinne, Dr. Cohen’s nurse, spent additional time with us, explaining the plans for the day of surgery. One of us would be allowed to go into the operating room with Annie until she fell asleep. We would then return to the PICU waiting room. A nurse from the surgery team would call the PICU phone every two hours to update us on the surgery. Because anesthesia can present some risks for patients with Moyamoya, it was possible that only one side of Annie’s head would be repaired, and another surgery would need to be scheduled. 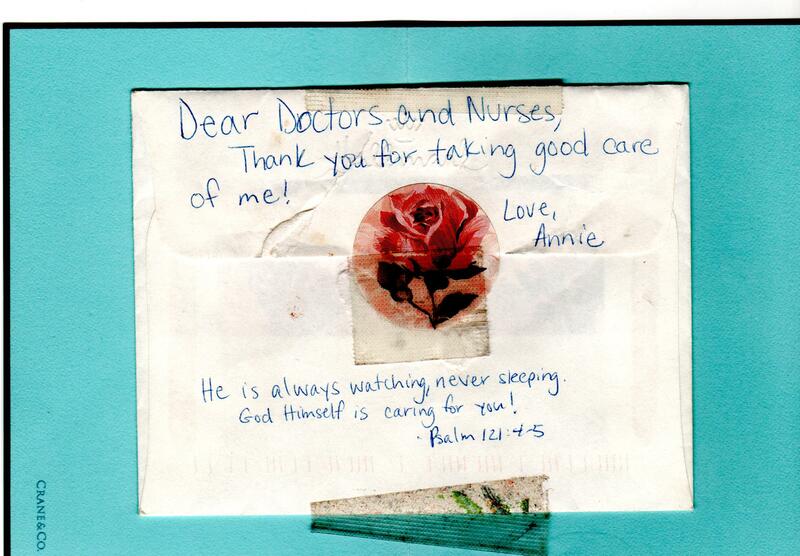 Corinne also told us that if Annie was having difficulty recovering, she would remain on the ventilator after surgery. Finally, Corinne broke the news that I had feared: Annie’s head would be shaved. For some reason, this was the most distressing aspect of the surgery for me; it seemed so invasive and personal. She’d lost her speech, her strength…now her hair? Inside, I raged, “This disease is erasing my daughter!” We explained this part of the surgery to Annie, and she was quite teary. She recovered quickly, though, with the reassurance that her hair would grow back …”unlike Daddy’s,” we told her! She smiled and patted his head. When I called my sister that afternoon, I broke down. “They’re… going to… shave… her hair, Betsy!” The sobs wracked my body, and I was embarrassed that this was the issue on which I was stuck.”Oh, Katie,” her voice kind and soothing. “I know that’s upsetting. But you know what? I’m going to buy her a hat…a really cute hat and I’m going to bring it for Easter!” And I recovered…not quite as quickly as Annie…but knowing that Betsy would be with us, bearing a hat, made this impending indignity easier to endure. crying… thanks be to God for you. …and thanks be to God for YOU, Kerri PD! Love you. powerful, Katie…very powerful. Your writing makes me feel like I am right there.